We all remember Jurassic Park and now there is a special ski resort where dinosaurs can go ski just like people and it’s called Juraski Park. Of course dino bones need to be careful when they go ski as you don’t want to fall and break something. 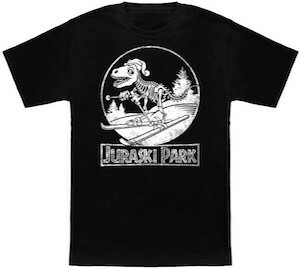 On this fun t-shirt you can see a Jurassic Park style logo but then with a skiing dino wearing a hat and no skin just bones and below it there is a banner that says “Juraski Park”. This fun ski t-shirt comes in a men and women’s version in many colors and in sizes Small – 6XL. Ready to go skiing? Just wear this fun Juraski Park Logo T-Shirt.